BANGKOK (AP) — World shares were mixed Tuesday, with European benchmarks mostly retreating by midday. But markets in China gained after the government set a 6-6.5 percent growth target for this year, suggesting strong government support for the economy. Germany’s DAX slid 0.1 percent to 11,579 and the CAC 40 in France fell 0.2 percent to 5,275. Britain’s FTSE climbed 0.3 percent to 7,155 after surveys indicated that the British economy held up in February in the face of Brexit uncertainties, although much of the growth was due to firms and consumers stockpiling in case the country leaves the European Union with no deal. Wall Street looked set for a recovery, with the future contract for the Dow Jones Industrial Average up 0.1 percent at 25,850. That for the S&P 500 was also up 0.1 percent, at 2,795. In Asia, the Shanghai Composite index rose 0.9 percent to 3,054.25, while the benchmark in Shenzhen, a smaller, more domestic-oriented market jumped 2.3 percent after Chinese Premier Li Keqiang told the annual session of the country’s rubber-stamp parliament that the government was setting the growth target close to last year’s 6.6 percent growth. That was a three-decade low, but the target shows official determination to shore up the cooling economy and prevent politically hazardous job losses. The slight reduction in the target was “an acknowledgement that the economy is slowing, though growth of 6 percent or above remains faster than what we think is achievable in practice,” wrote Julian Evans-Pritchard and Chang Liu of Capital Economics in a commentary. “Our forecasts for growth to stabilise later this year assume that some further policy support is forthcoming. Today’s work report suggests it is,” it said. But elsewhere in Asia, the focus was mainly on an absence of news of fresh progress in China-U.S. trade talks. The upward momentum from Monday has faded as investors grow impatient for more details on reports that the U.S. and China are moving closer to a deal to resolve their costly trade dispute. Japan’s Nikkei 225 index lost 0.4 percent to 21,726.28. 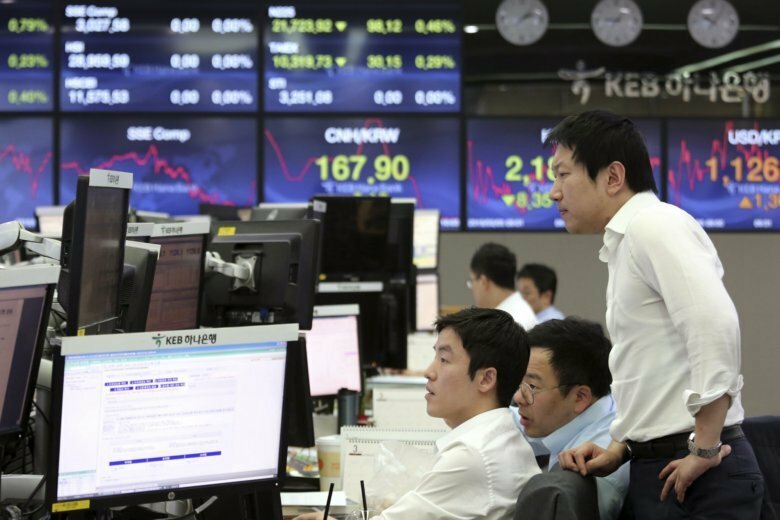 South Korea’s Kospi dropped 0.5 percent to 2,179.23. Hong Kong’s Hang Seng was flat, at 28,961.60. Australia’s S&P ASX 200 fell 0.3 percent after the central bank opted to keep its key policy rate at 1.5 percent. Shares fell in Taiwan and most of Southeast Asia. The world’s two largest economies have pulled back from an immediate escalation of their damaging trade war, with President Donald Trump postponing a deadline for raising tariffs on more Chinese goods and media reports saying the nations could strike a deal this month. Investors have been hoping for a resolution in the long-running trade dispute between the world’s biggest economies over U.S. claims that Beijing is stealing technology and forcing companies to turn over their know-how and trade secrets in order to do business. ENERGY: U.S. crude gained 23 cents to $56.82 per barrel in electronic trading on the New York Mercantile Exchange. It rose 1.4 percent Monday to settle at $56.59 a barrel in New York. Brent crude, used to price international oils, picked up 25 cents to $65.92 a barrel. CURRENCIES: The dollar rose to 111.94 yen from 111.74 yen on Monday. The euro weakened to $1.1332 from $1.1341.